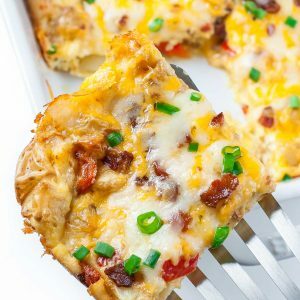 This easy Cheesy Roasted Potato Breakfast Bake is a tasty way to sneak veggies into your breakfast! 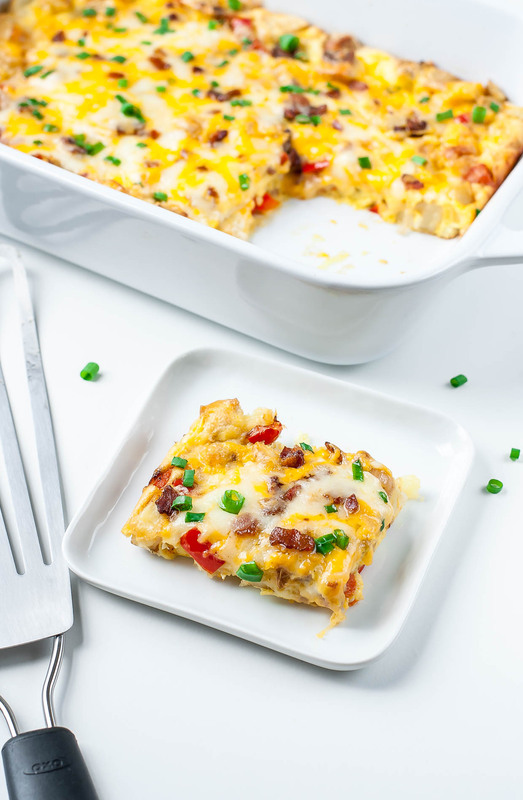 Served up casserole style, it’s great for holidays or a brag-worthy brunch with family and friends. My life’s goal is to add veggies to ALLTHETHINGS. Breakfast is typically a meal that winds up pretty carb heavy (bagels, cereal, oatmeal, toast) or revolves around all things bacon, egg and cheese. I’m all for it (because, YUM!) but feel much better starting my day with a savory breakfast spiked with veggies. Breakfast bakes to the rescue!!! This recipe yields 4-6 squares of crustless veggie quiche. It’s perfect for a small family and yields tasty leftovers too! Feeding a crowd? Awesome! Double the recipe (it’s oh-so easy to do!) and use a large baking/casserole dish and you’re good to go! 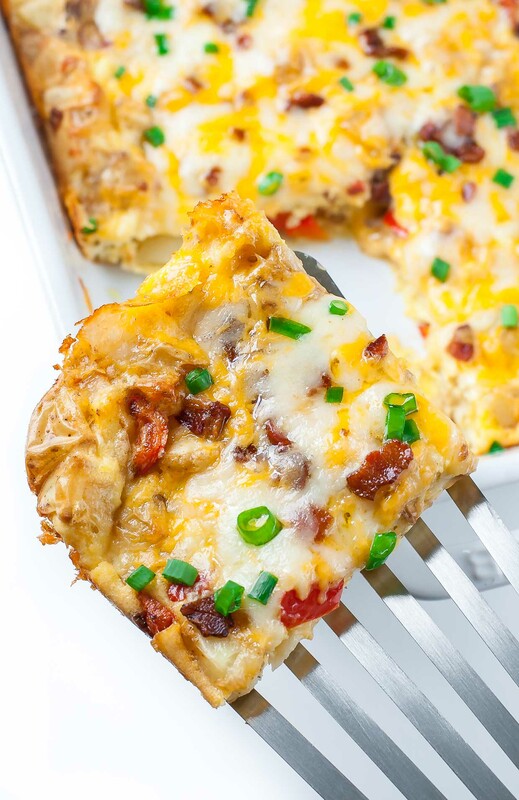 Breakfast casseroles are crazy easy and oh-so versatile. Serve it up as a cozy weekend brunch or make ahead for heat-and-eat breakfasts during a busy week. 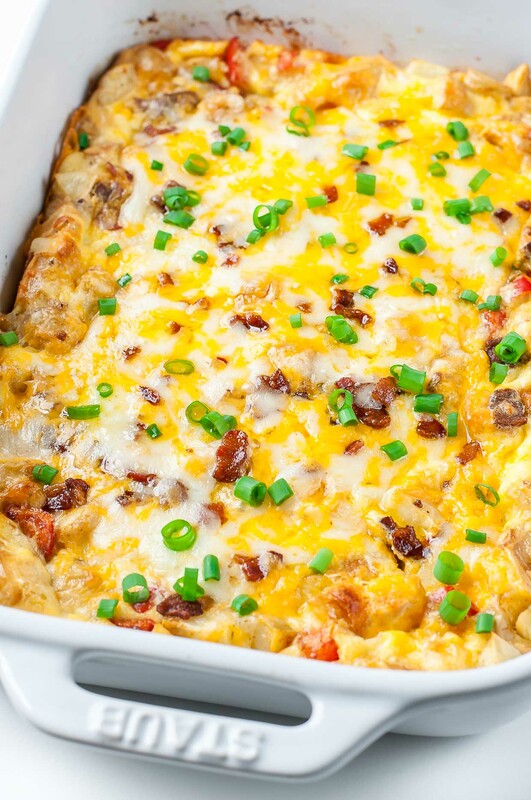 This easy Cheesy Roasted Potato Breakfast Bake is a tasty way to sneak veggies into your breakfast! 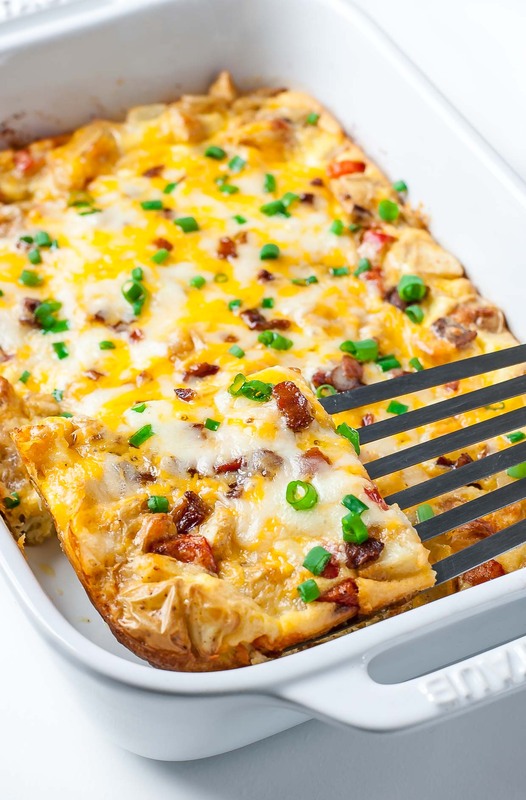 Served up casserole style, it's great for holidays or a brag-worthy brunch with family and friends. Line your baking pan with parchment paper or grease lightly with a little olive/coconut/avocado oil. Toss diced potatoes in a light drizzle of oil and season with pinch of salt, pepper, and paprika. Mix well to coat (I use my hands) and roast for 25-30 minutes or until deliciously crispy and golden. Turn oven to 350 F after roasting. While your potatoes roast, prep the rest! Stack your bacon, slice in half, then chop into little squares. Crisp on a skillet set to medium-high heat then transfer to paper towels to drain. Pat dry + set aside. Wipe skillet clean and sauté your onion, peppers, and any other veggies you'd like to add to the mix. Set aside. Whisk together eggs and cream, and season with a teeny bit of salt and pepper to taste. Lightly grease your casserole dish with your favorite healthy oil to prevent sticking (butter works too) and add your roasted potatoes. Top with sautéed veggies, half the cheese, and half the bacon. Pour egg mixture over the top and add remaining cheese and bacon. Bake at 350 F for 20 minutes, or until the eggs are fluffy and cooked through. Top with chopped green onion and dig in! This is great the first day AND the next! I use this dish as a make-ahead breakfast option for my family of 3 and love having slices to reheat the next morning! Simply microwave in 30 second intervals until hot and melty. Salsa and avocado/guac with plain greek yogurt also make a delicious topping! My t-rex friends are welcome to add your favorite breakfast protein. Crumbled breakfast sausage would be stellar here, but you haaaaaave to promise me that you’ll veg it up too. Deal? Vegetarian? I gotcha! feel free to swap the bacon for vegetarian bacon bits or your favorite vegan alternative. Some added chopped spinach and sprinkling of salty feta also makes a great sub here! I’ve even tried “bacon” made from seasoned mushrooms and coconut flakes that’s really really good – choose your favorite swap or simply skip and you’re good to go! I first made this for Christmas breakfast but have now made it almost every weekend since! It makes a fabulous reheat breakfast for work mornings. I mix sweet & regular potatoes. Thanks for the awesome recipe! I pretty much live off of your recipes btw! Thank you! OMG I looooove that you added sweet potatoes too – I bet it’s crazy delicious together!